It was "Pastor" or to use his proper designation, the false Apostle January Aage Torp who made me aware Arnhild Gjendem that had the same "Catholic" view of marriage according to Torp meant and said. Here are some excerpts from her view of marriage taken from neat (she is with two shoes that we link to on our website and some articles from their website as we took in after Torp made me aware that we had much in common with them). So get a judge even though we have a biblical or unbiblical views on divorce and remarriage. Be like the Bereans: Acts 17. 10 But immediately sent the brothers Paul and Silas away to Berea. When they arrived, they went to the Jewish synagogue. 11 Now these were more noble than those in Thessalonica, for they received the word with all readiness, and searched the scriptures daily whether it was just as it was told them. 12 Therefore many of them believed, and not a few of the distinguished Greek women and men. (End of quote). Examine the word of God about everything you are presented so that the word of God teaches and speaks. This illustration of the false Apostle January Aage Torp as "of course" itself is divorced and re-married as believers with a woman 20 years younger than himself (see my article why divorced older men want younger women to commit adultery with our blog). Here are Torp with his first wife and straight and her commits adultery with that then his wife No. 2 and who is not his wife. Many children suffer. They have no fixed abode, but commute between mother's new home and the father's new apartment and his new lady. They must relate to the father's and mother's new flame. They are introduced to Dad's new flame child and maternal new flame children and father's new flame family and father's new flame friends and also colleagues and neighbors and also native new flame friends, family and neighbors. This needs children / young people might do while they are in the middle of puberty and to find out her new adult self. Or while they have young children and infants experiencing night watches and småbarnstid. Two children thrown gifts they received from their father this Christmas. They would not accept the gift from father who has moved from them and remarried with a foreign lady. Many children also must change schools and change friends right in the evil time of divorce because the mother or father is not able to sit with the house when they were alone because it had two incomes to to be able to keep the home. Upon remarriage to the children move back into the mother's new flame house that might have a brand new place with brand new school and new friends again. Chaos for children, pain, suffering, loss and distress! The divorce rate in second marriages is much higher than the first. While the divorce rate at first marriage is (was) about 50%, the percentage next marriage 75%. That's why every chance that no re-married to fail after the first rapture happiness. When the father discovers that "flame" unfortunately was not a flame of love, but of old bitterness that chafed, perhaps from the time even before his first marriage. Mother / father must deliver their young children at the door to the spouse and the new flame as she / he does not know. Mother / father does not know what the new limits will translate for the children, what values ​​are the new flame and communicator. Mother / father and new flame is not on speaking terms and unable to talk, and your spouse will not talk with the mother / father unless the new will come along. Therefore, the mother / father deliver the dearest they own their children into the arms of a stranger, not just hours, but her children will be with them for the weekend and every Wednesday for example. The river in the hearts of those spouses who supply and deliver their children into it for them completely unknown. Many have unresolved relationship with her estranged husband. So many things they have not been speaking out about, record, and settled in. There is so much pain around the divorce, but also around the face of the new or the new (all the new people and the houses and apartments of the children and the adults shall relate to.) The Bible gives good advice: reconciliation, settlement, forgiveness, healing and restoration! The Bible makes no provision for remarriage? Ottosen're absolutely right! Remarriage is NOT biblical solution! One must not take a single Bible verse and create their own learning of it so that it unfortunately has been done in relation to Matt.19, 9 including The Bible does not teach anything about the "innocent party" to be able to marry again! "Therefore she is called an adulteress if she lives while her husband becomes another man's wife." Rom.7, 3rd The Bible takes very seriously the marrying another while one's spouse is alive. Why the Bible is so clear MOT remarriage? Because the Bible gives the best advice! The Bible gives advice about not escape the crises, but go into the midst of the difficult time with Jesus! Jesus can heal and fix the tangle that people are not able to solve! He does not want their homes to be broken up and the children to commute between mother and father. He wants "to innovative desert Eden"! Where it is dead emotionally, where he wants to create new love. Where there are even violence and infidelity can save him, doctors and all! The churches must become places where people are helped to believe God for help and not places where we could afford to live like the world. Our country runs today (22 \ 9-12) appears on the first page Odd Bondevik who marry. It's good that people are happy. But it is no problem to marry a divorcee? Media is a strong influence agent! It hits the front page of the newspaper gets a LOT of attention! In the churches, as in the community, there are unfortunately many people who are suffering because of divorce. It is MUCH pain. There are adults who are suffering, and there are many children and youngsters! This pain I wish more churches took hold in. I do not want to be a "party brake" for Bondevik! I wish him all the happiness he can get! But it is no problem? There are many Christians out there who are divorced and wondering the way forward. And there are many out there who have encountered a sign and wonder if it's okay to get married? There are also many who wonder, but marries without thinking much about it, there are so many others that do. According to the Bible, it is not without problems! "Whoever divorces his wife and marries another driver hair. And whoever marries a woman divorced from her husband commits adultery." Luke 16.18. We read accordingly in Matthew 5.32 "Whoever marries a divorced woman commits adultery." It is the truth that sets free (John 8.32). We can not and must not deny the Bible. Such a result as this that our country today have given this matter can not be left without a comment. Our country are indeed the question: "Was it hard for you to plan your marriage to a divorced woman, Odd Bondevik?" What about the common man, when the former conservative bishop marries a divorced? People have to be totally confused about God's Word! And that's exactly what happens! Such examples unfortunately weakens people's confidence in God's Word! Rune Wand: It is true as the Bible portrays a marriage, one can not remarry before the show criteria must be in place. but today, many Christians are not bothered about these scriptures I will now refer to. Which only acceptable reason for divorce mention Jesus? It's in the Bible, Matthew 5.32. ?? But I say to you, whoever divorces his wife for any reason other than adultery, he will be responsible for the commission of adultery with her. And whoever marries a divorced woman commits adultery.?? How long is the marriage to last? It's in the Bible, Romans 7.2. ?? A married woman is bound by the law to her husband so long as he lives. But if her husband dies, she is released from the law of her husband.?? What advice is given to who to marry? It's in the Bible, 2 Corinthians 6.14. ? ?, Do not be yoked together with unbelievers: For what partnership have righteousness and iniquity, and what communion hath light with darkness??? God gives his blessing to romance and sexuality gift when exercised within the bonds of marriage. It's in the Bible, Proverbs 5:18-19, TLB. ?? Then shall thy fountain be blessed. Enjoy your youth wife, the loving hind, graceful gazelle! Rejoice always at her bosom, her love alone fill Yourself! Taking care of your marriage is important because it is hallowed and in the eyes of God, this is something he puts high here it says that it is only infidelity that makes it possible for Christians and divorce. but the question is when can remarry then? either have to wait until the one is separated from the dead? But the Bible is clear on this, and it is God's word we must deal with. not human bids Rather then one will live in adultery. based as it is. Rather, one should not take this as seriously as we live in another time, because that's usually what is the argument of many Christians, who have accepted cohabitation. It's nice that you illuminate this at this time, never before have there been so many divorces among Christians now. 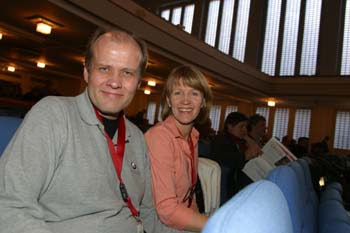 Arnhild Gjendem writes: Thanks for the comment Rune! It is difficult for a priest and a pastor who meet people in troubled marriages or divorced. What consolation can they give? Unfortunately humanism that has gotten too big foothold in the churches. The need and the strong desire to help you give advice that really does not follow scripture. But: it is amazing that there is truth that sets people free! Therefore, it is actually very important that we give them the radical, double-edged, sharp Word of God! "... Out of his mouth went a two-edged, sharp sword." Revelation 1.16. It also applies HOPE! We have a God who is big and who can turn night into day, and darkness to light also in divorce situations and "dead" marriage! "Fear not, only believe!" said Jesus into a situation where death had occurred!! thing that happened was that life came back! (Mark Gospel 5, 36) God can restore the most hopeless marriage! We must ask God to have more faith in him because he CAN! Arild Kvangarsnes writes: The Bible says that whoever marries again commits adultery. Thread Starter saying this is the truth, ergo she believes that those who remarries commits adultery. It is an idiotic and stigmatizing statement. How can commit to another person you love be adultery? How can anything good come out of such a claim???? Arnhild Gjendem writes: I have quoted Jesus in the Bible! I do not own teachings on topic! I have repeatedly experienced people who have expressed joy that someone dared to speak the truth to them, and how this has led to confession and repentance and freedom and joy in your life! Actually not just think it, but I KNOW that Jesus is not a liar, but one who tells the truth! But Jesus loves people! He loves us so much that He atoned ALL our sins and punishment! He does not talk just to talk. He talks to help people!! There are many things that make people have to wonder if the Bible is true when it sees how they live! It is quite right that you point out, but also with remarriage must be! The Bible talks a lot about holiness and godliness! It must be back in our parishes for God is love, but He is also holy and pure! Final Comment: The more I read and learned things here regarding divorce and remarriage. So it tells me that a minister or overseer can not be divorced and re-married as believers or married a divorced, finished work! If one opens up for this, so open one up for Satan, people's opinions and all that strife, discord and division. Rom. 16. 17 But I beseech you, brethren, to keep an eye on those who cause divisions and offenses contrary to the doctrine which you learned, and turn away from them; 18 for these serve not our Lord Jesus Christ, but their own belly, and by his sweet voice and fair speeches deceive the hearts of the simple. 19 For your obedience is come out to everyone, so I rejoice over you, but I want you to be show for good and clean of evil. 20 And the God of peace will crush Satan in haste under your feet. Our Lord Jesus Christ be with you! (There are those that open up for divorce among believers, especially pastors and preachers in the church of God which cause divisions and offend! ).